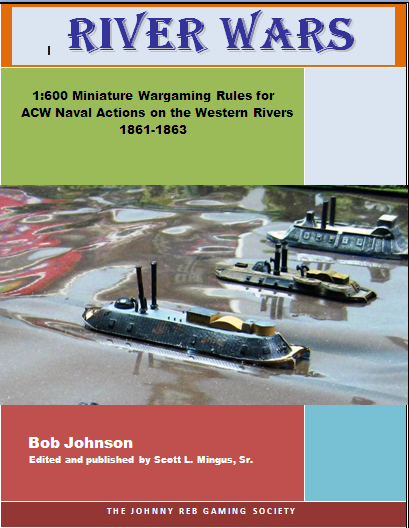 The Johnny Reb Gaming Society announces the publication of River Wars, a fast-play, easy-to-learn set of miniature rules for 1:600 American Civil War riverine actions such as naval engagements on the Mississippi River and other rivers in the Western Theater. 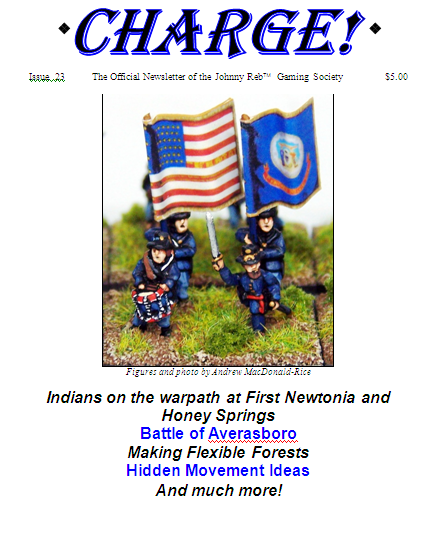 The rules are available on line as a .pdf file directly from the Wargame Vault for only $7.99. Click here for a link to the website and to read a few pages for free! 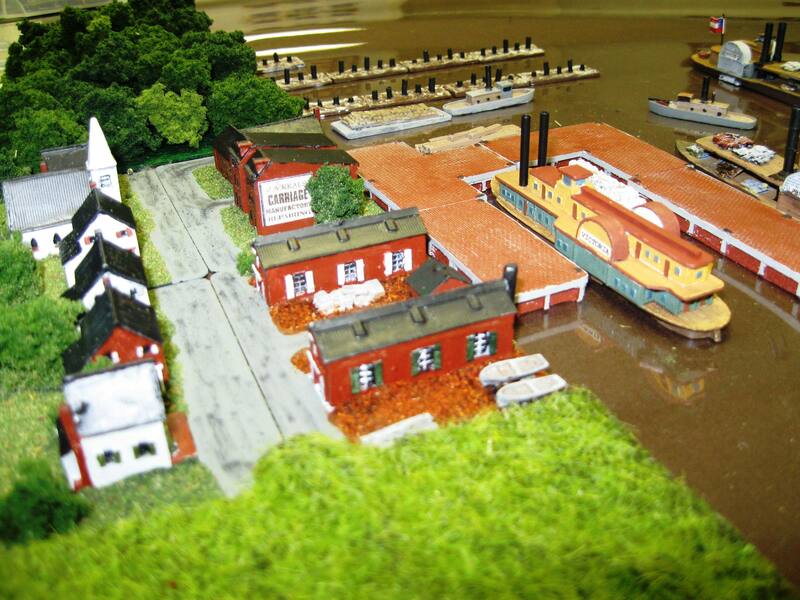 I have completed my winter project, laying out and creating 16 feet x 1 foot riverbanks for my new wargaming interest, 1:600 scale American Civil War riverine / naval wargaming. This is generic terrain meant to evoke the general flavor of the terrain, with bluffs, farms, woods, watercourse confluences, and small towns with their wharfs and docks. And, oh yes, complete with a series of Confederate forts and campsites, daring the Union flotillas to take a crack at running past them. Watch out for the torpedoes (mines)! Is the wargaming hobby graying? 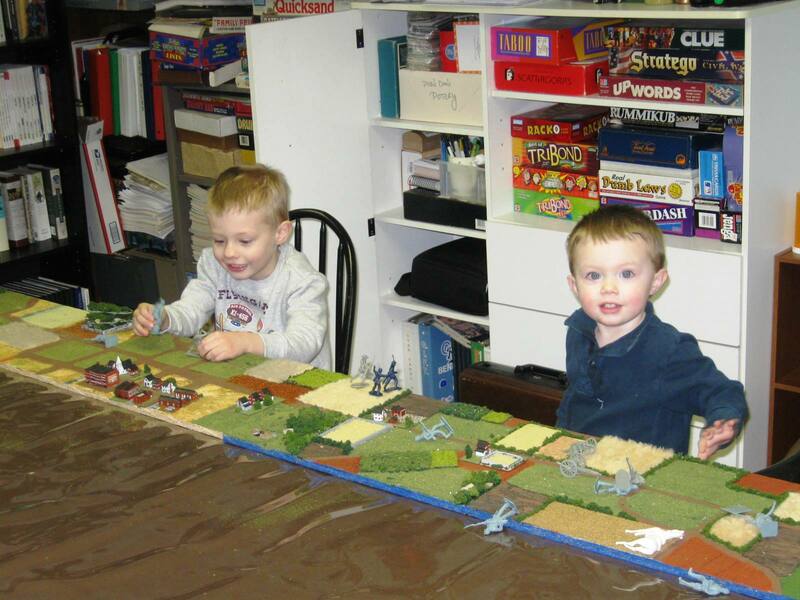 Over the past few years, there has been much discussion on the graying of the hobby of miniature wargaming. Hobbies such as stamp and coin collecting, model railroading, model rocketry, radio controlled airplanes, and many others appear to also be struggling somewhat to attract younger aficionados, to various degrees of course. I am doing my part to attract young gamers to the hobby of historical miniatures! Start them with their own plastic Civil War 54mm figures from a Gettysburg gift shop, and teach them some rudimentary rules (in the case of my younger grandson, it’s set the soldiers up and knock them down). In the older lad’s case, it’s about rolling the dice, counting the spots, and determining where to go from there. He’s a little young yet for a Combat Results Table. Casemate Publishing is the national distributor for my most popular book, Flames Beyond Gettysburg: The Gordon Expedition, June 1863. David Farnsworth and his crew are excellent to work with, and are a credit to the historical publishing community. 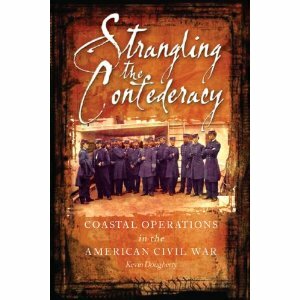 Casemate’s newest Civil War release comes out in May 2010, Strangling the Confederacy: Coastal Operations in the American Civil War. Written by Kevin Dougherty, this book is a sweeping overview of the U.S. Navy Board’s ambitious 1861 plan to systematically capture key ports and cities all along the Atlantic and Gulf coast of the breakaway Confederacy. A small group of leading scientists, engineers, and naval officers formulated a plan of operations that targeted Rebel-held coastal fortifications and towns, which was approved by the Secretary of the Navy Gideon Welles as a vital step in the overall objective of strangling the Confederacy through a naval blockade and then picking off the cities one-by-one. The book is an admirable effort in giving the casual reader an excellent summary of the key operations within the plan, broken down by theater and target in roughly chronological order. A special focus is given to the three most difficult objectives – Charleston, Mobile, and Fort Fisher / Wilmington. I purchased a few 1:600 scale model Civil War buildings from Bay Area Yards a couple of weeks ago. After painting these tiny structures (that was a painstaking task!) 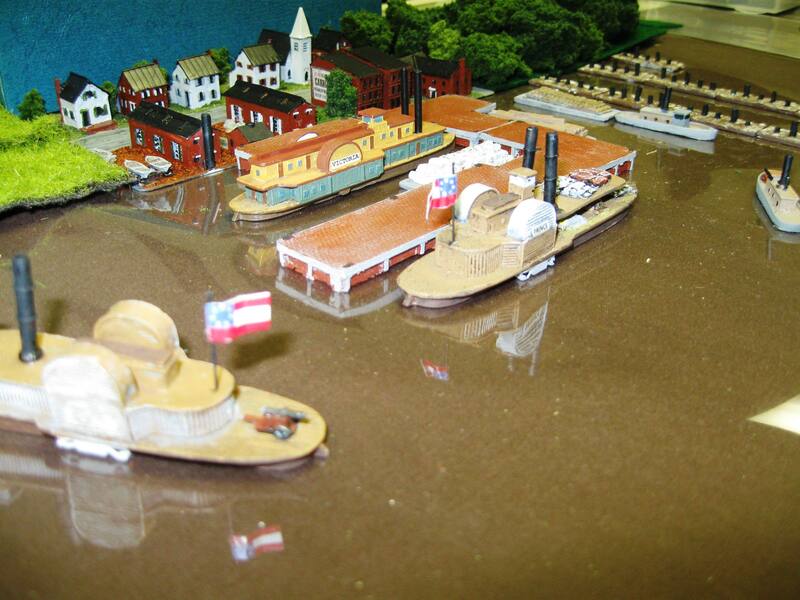 I decided to mount them as modular mini-vignettes that I could adjust and expand for various future ACW naval wargaming scenarios. These buildings were a buck or two apiece and are useful for detailing and modification. The docks and piers are busy places as the riverfront bustles with activity. No one suspects that the next day will bring the specter of war to Johnson’s Bend, Mississippi. 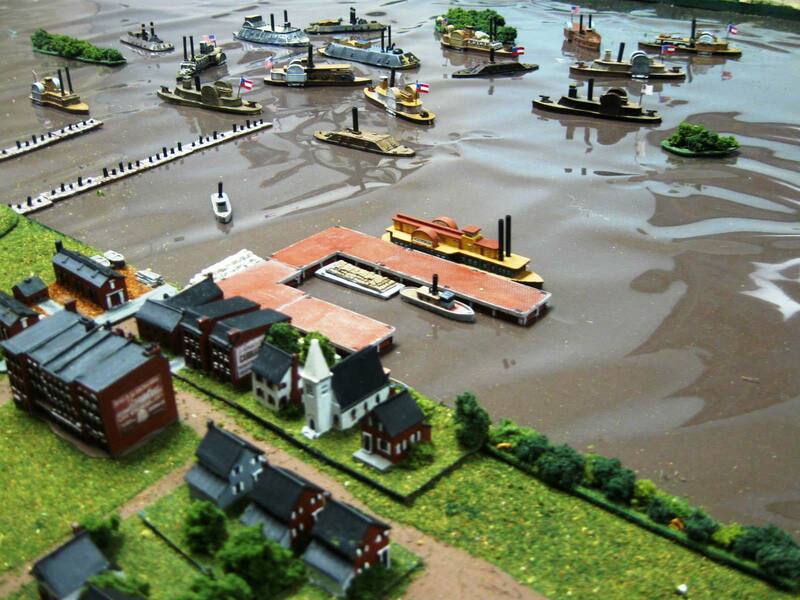 A Yankee fleet under Admiral David Dixon Porter is steaming downriver to capture the supplies being stored in the town’s many warehouses.